I left Graham at the guesthouse catching up on some emails (same same working from home but different!) while I went to do something I have been meaning to do for ages …………. 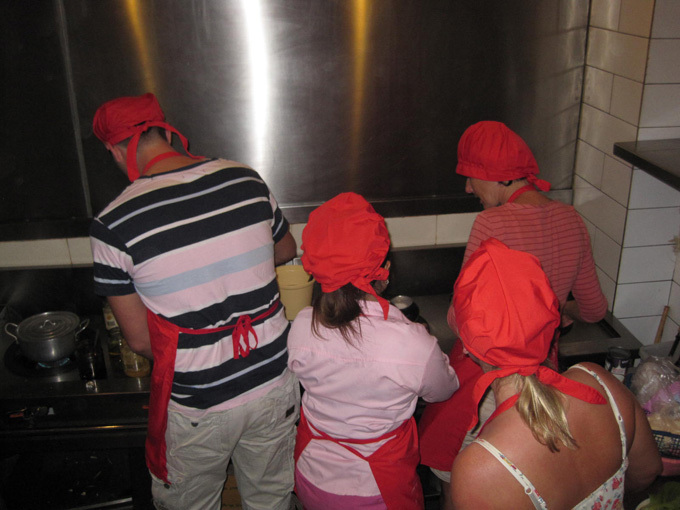 cooking lessons! 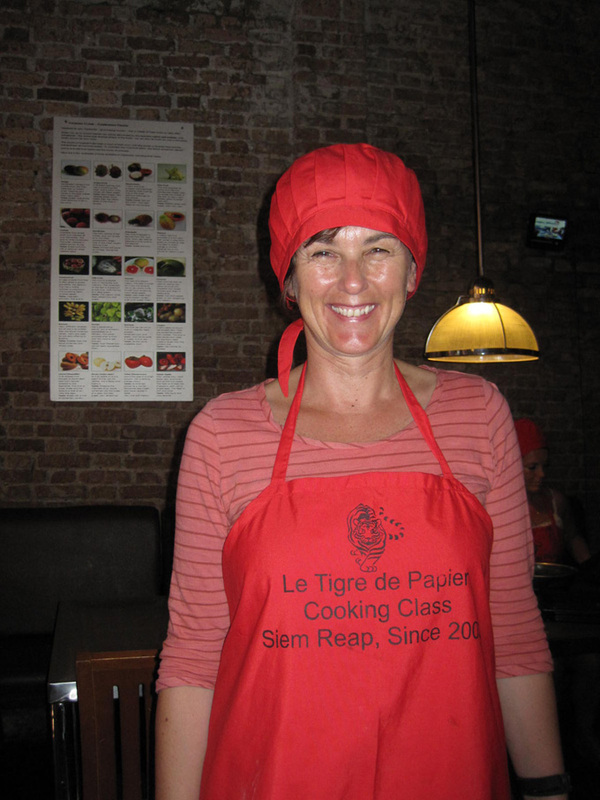 I decided to go to the Tiger de Papier Cookery Restaurant in Pub Street, which does three daily cooking sessions each lasting 3 hours. It is amazing value at $13 and you get to eat the food that you’ve cooked afterwards. When you arrive they ask you to choose a starter and a main course from their menu. 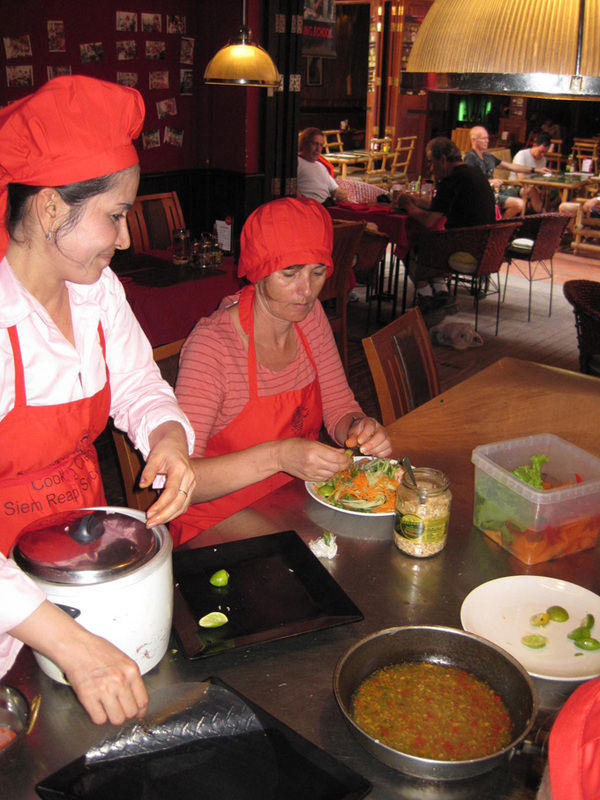 While I was looking at the menu two other people arrived for the cookery class, Vincent and Wendy from my home country The Netherlands, which was really nice. I choose a spicy shrimp salad and a Kmer chicken curry. We were told we would make a dessert together. 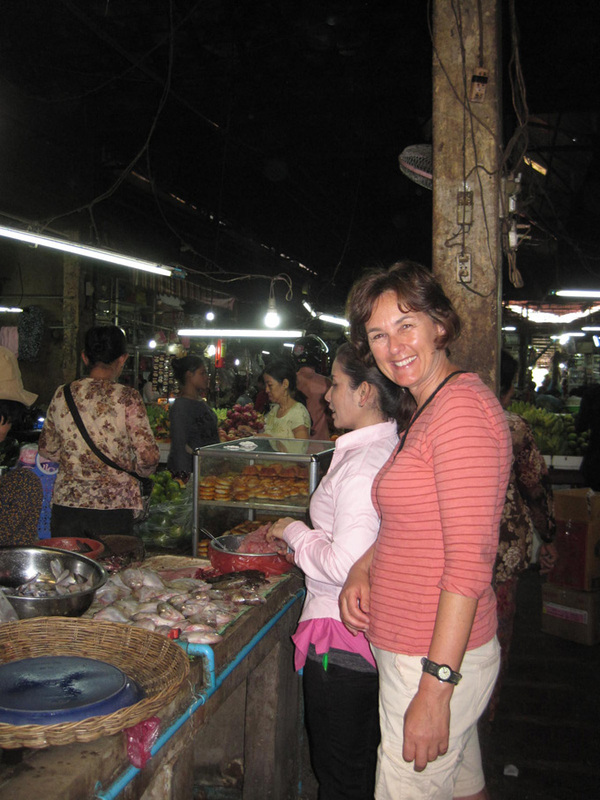 First it was off to the market to buy some ingredients and to show us the different vegetables, fruits and fish. Back to the restaurant for some serious work! 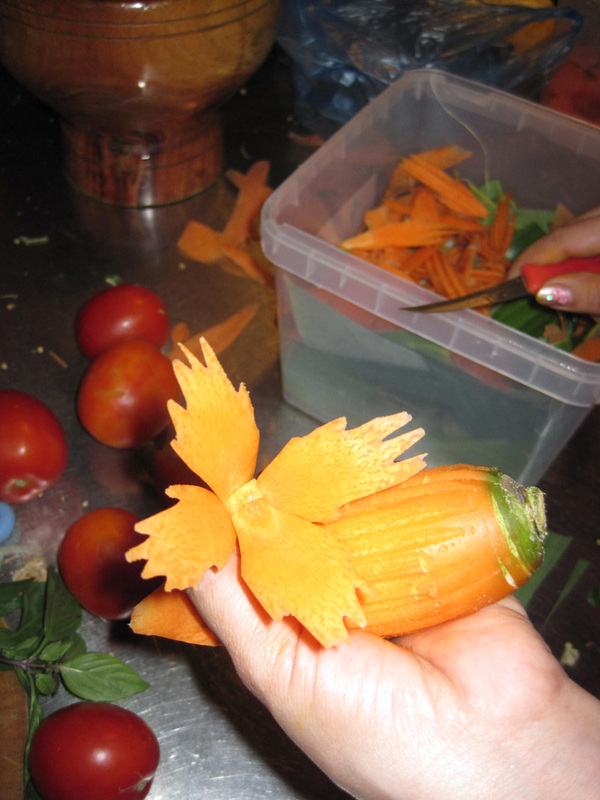 We were shown how to cut the ingredients and make some plate decorations using some of the vegetables. 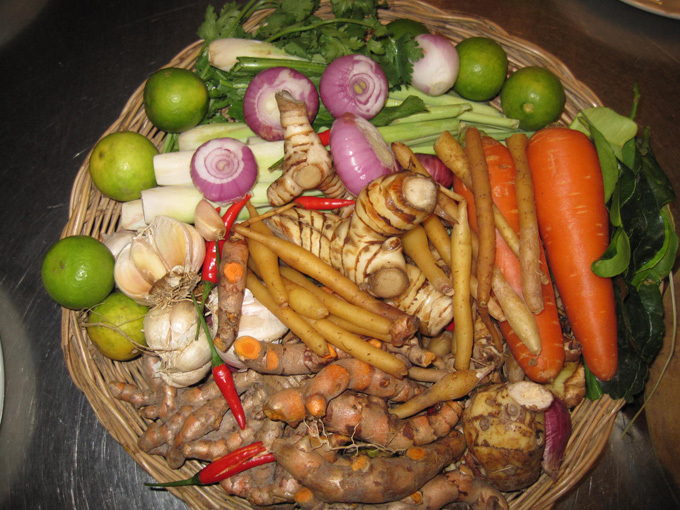 Then some of the ingredients were ground into a paste and then off to the kitchen for the final stages. 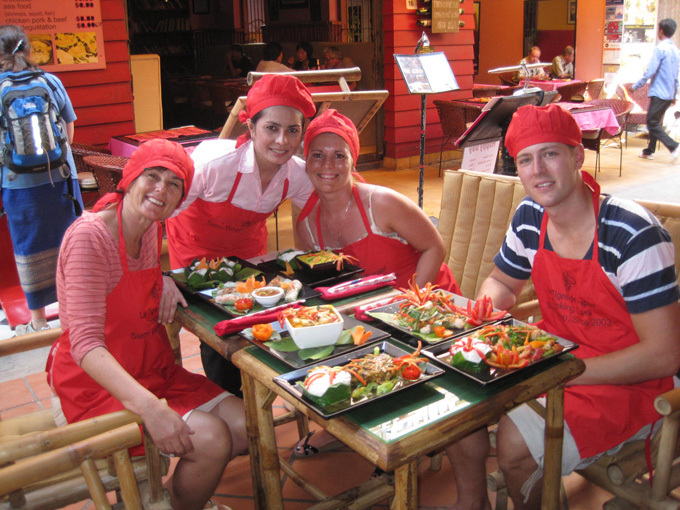 Once the dishes were finished we carried them to a table outside the restaurant and ate our meal. 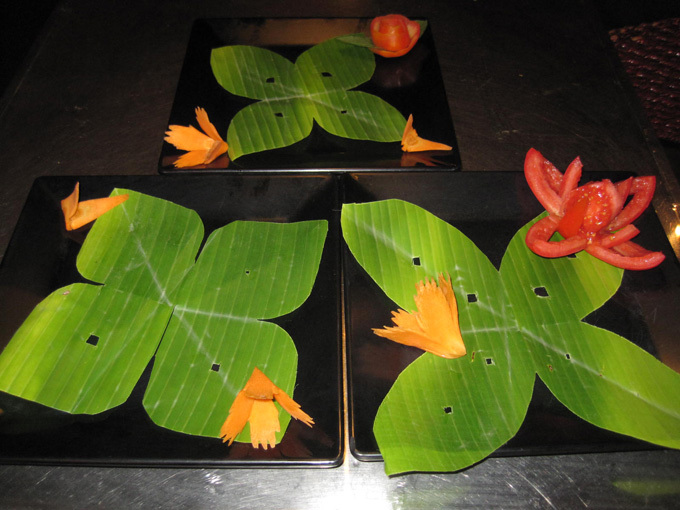 We all had such a great time and the food tasted as good as it looks! 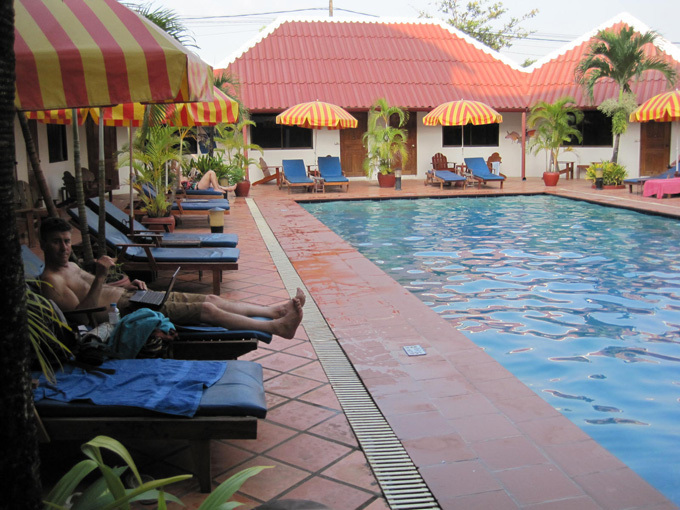 It was a nice way to finish our time at Siem Reap. In the morning we are booked for a shared taxi up to the Thai border. 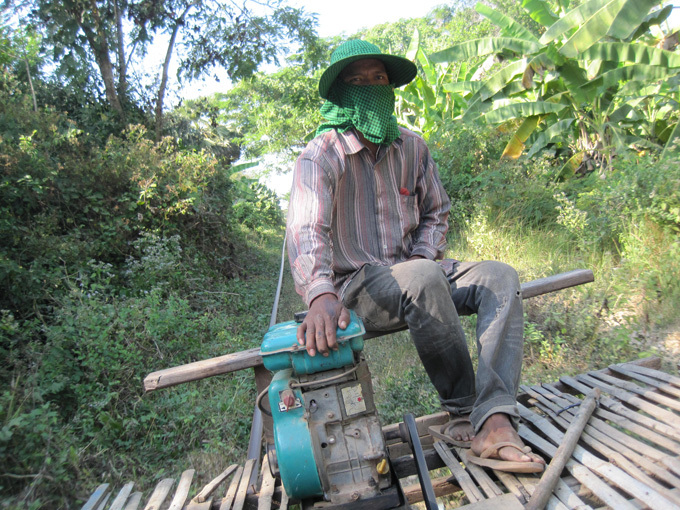 Yet another form of Cambodian transport to try! The boat stopped about half way and one of the boat crew showed off his best tricks. 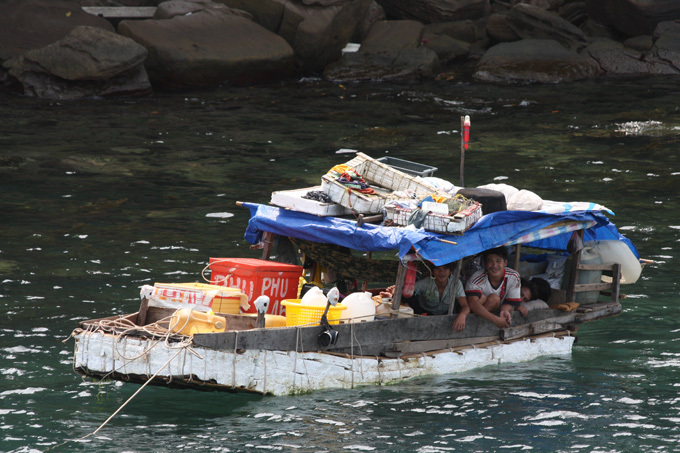 The sea was a bit rough in the open sea but in the shelter of the island it was dead calm. 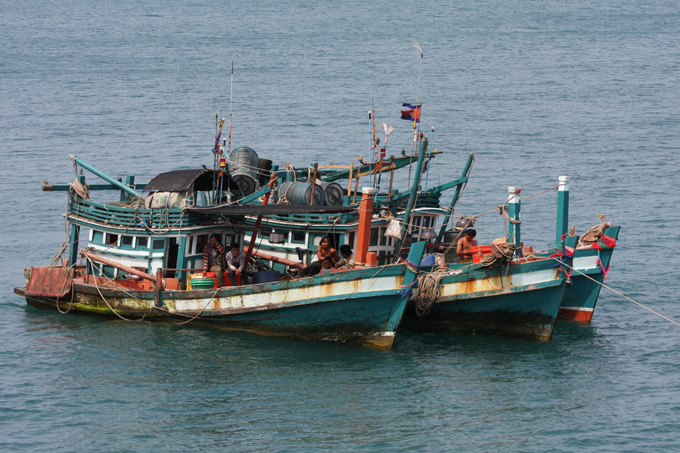 The fishing boats were also sheltering there, both the typical Cambodian style and some more modest ones! This one was made of slabs of polystyrene tied together with rope, but the owner was just as proud of it! About an hour later we arrived at the main beach. 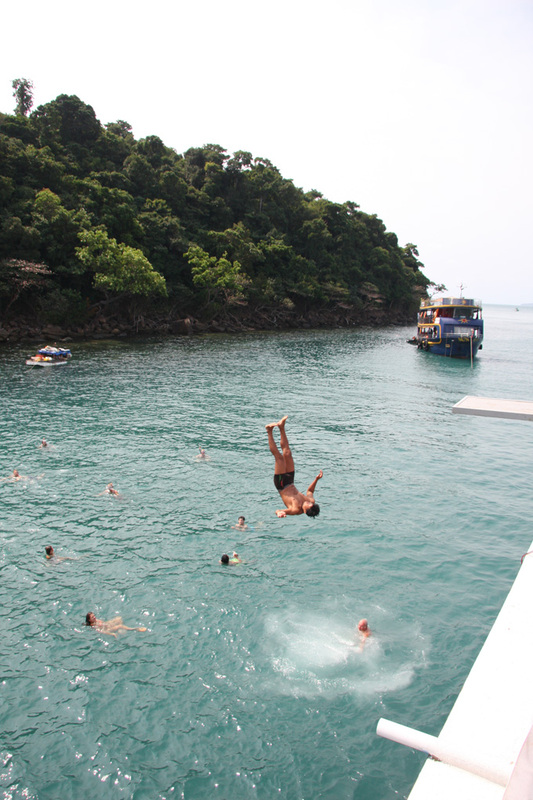 The water is pretty shallow and so you have to jump into the shallow water with your bags. 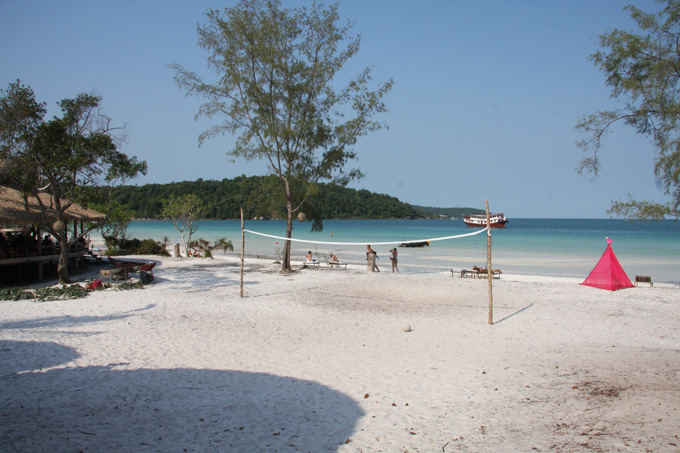 First impressions are great, white powder sand and turquoise sea. Immediately behind the narrow strip of beach is the jungle. Development has only happened in the last couple of years here. 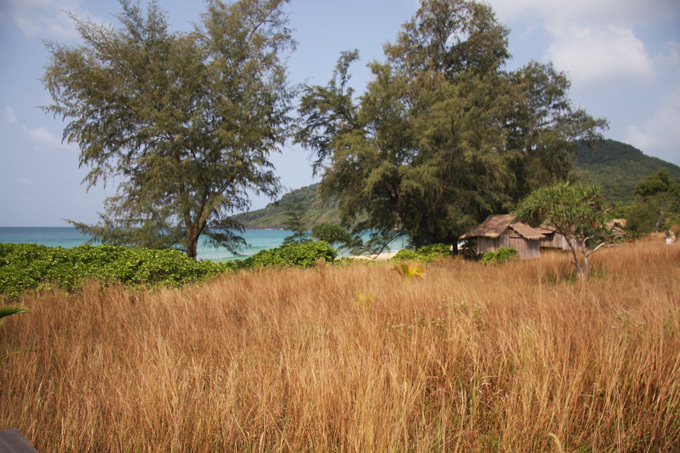 Before that, the only bungalows were on Lazy beach, a twenty minute walk across the island. 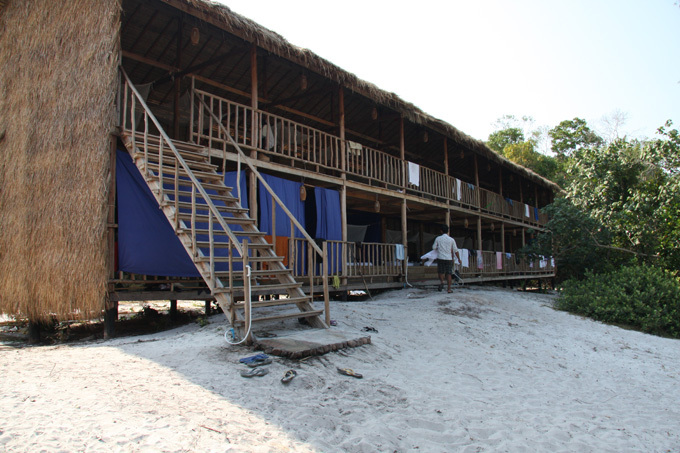 The arrival point is ‘The Beach’ which has a mixture of backpacker dorms and small bungalows. We stayed at the end of the beach where it is a bit quieter. 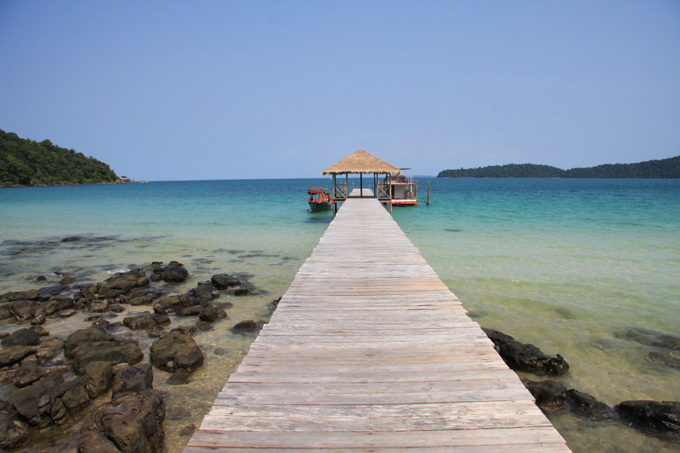 There is a new pier there built by the owner of the bungalows. 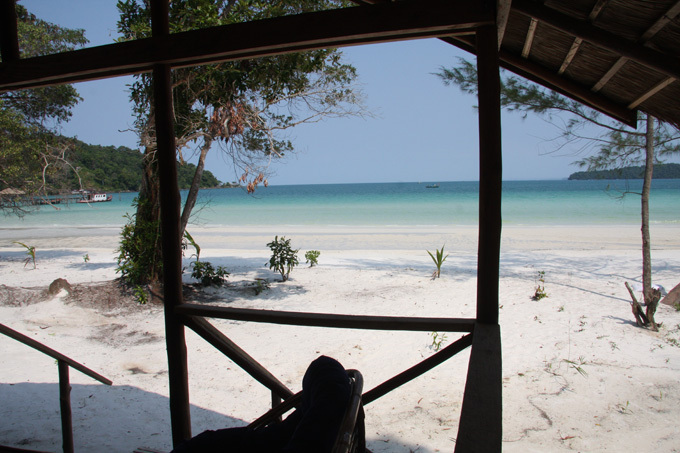 The view from our bungalow immediately made us decide to extend from two to three nights …. seven would have been nice! During the next few days we spent the time walking, swimming, eating and drinking. 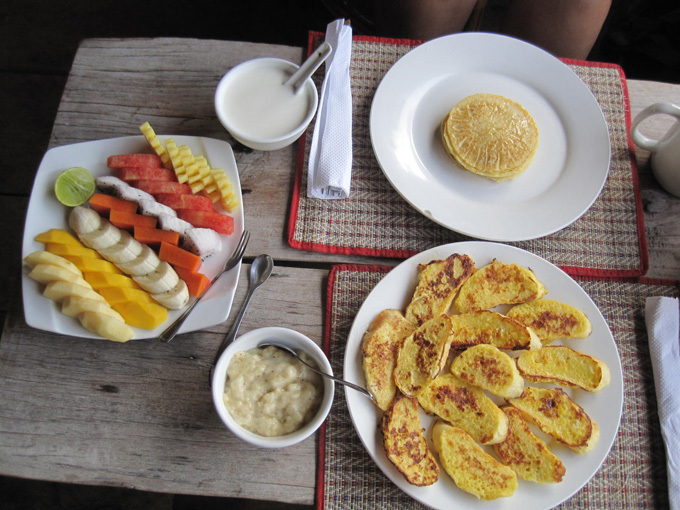 It was an easy walk to Lazy Beach which has a lovely beach side restaurant, with great fruit drinks and a mixture of western and cambodian food. 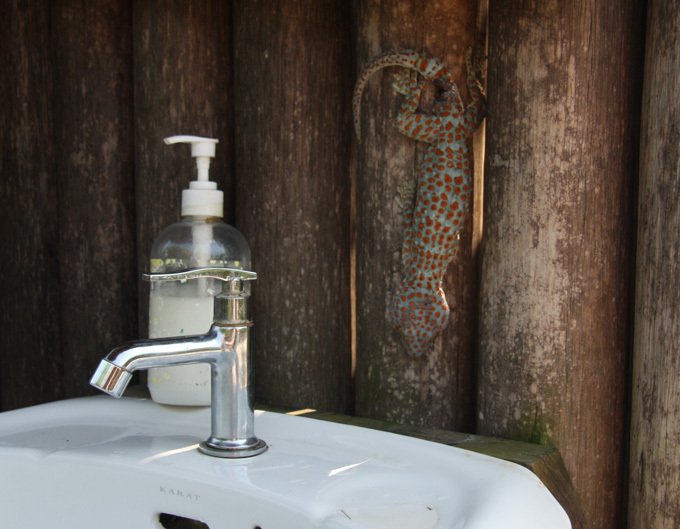 You have to remember that you are in the jungle, so you do get mosquitoes at night and the odd creature where you don’t expect one! This made Marjool jump when she went to wash her hands. 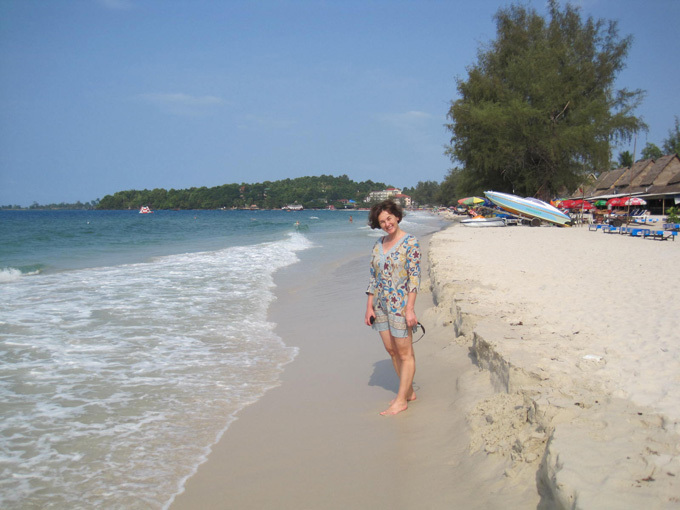 Our final day was spent walking across the island to a third beach with bungalows, Robinson Beach. 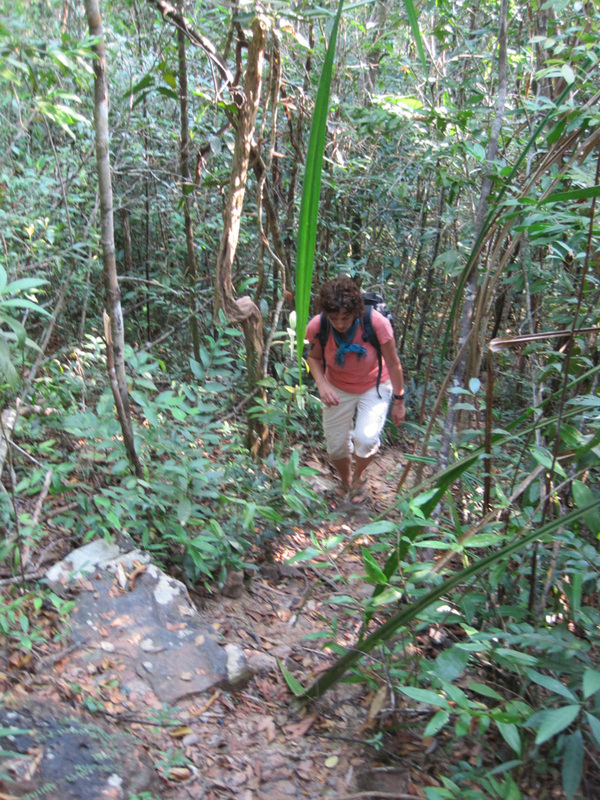 The path takes about 30 to 40 minutes to walk, but is steepish in places and it is quite warm in the jungle. It is a nice beach, but narrow and quite small. 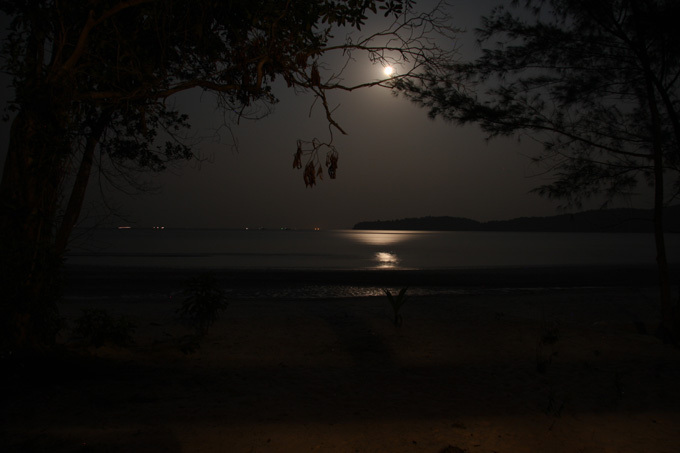 The final night was pretty noisy on our side of the island as it was a full moon party. Not big by Thai standards but still over 150 people, mainly from the mainland. 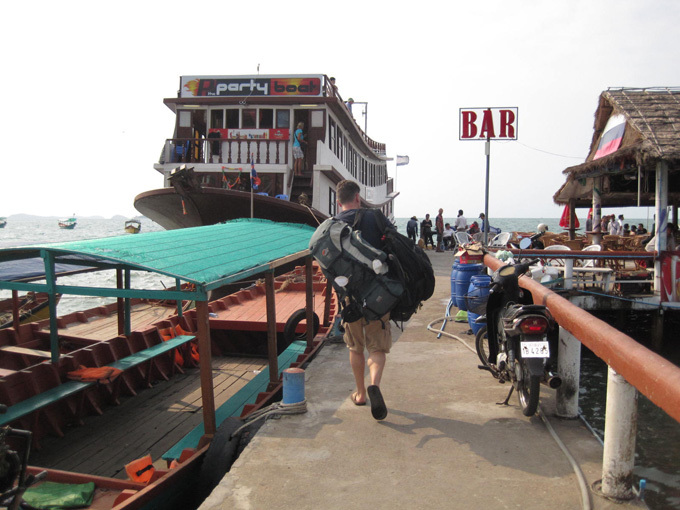 We were pretty boring and left well before the party got into full swing … more a young backpacker thing. The following morning we reversed the process with the boats and arrived back at Serendipity pier, ready for a night (sleeping bus) back up to Siem Reap. Although it seemed like a good idea, it felt really unsafe laying flat, with only a small edge at the front to stop you sliding forward. 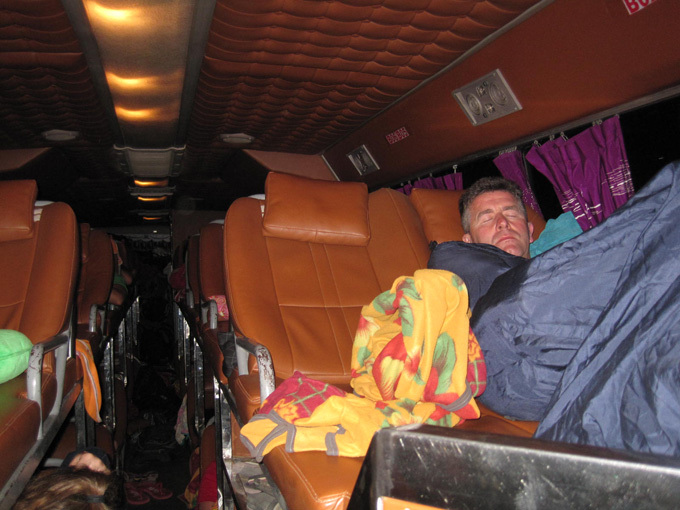 The bus went incredibly fast for the road and all night we kept thinking that if the driver fell asleep or had a puncture we would crash off into the trees at the side of the road, shooting through the windscreen feet first……. (I wish I didn’t have such a vivid imagination). 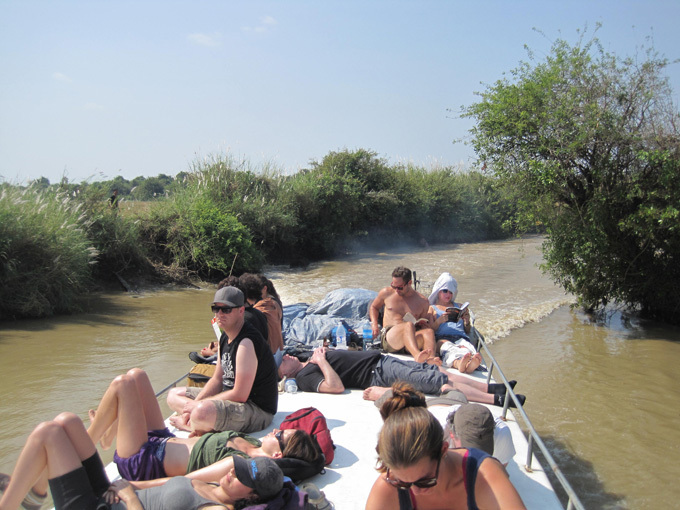 The lower bunks (which we had booked) would have felt much safer …… but the outcome would be the same! Oh well, we made it in one piece and put it down as an experience which we would not repeat. Strange how you see the danger more as you get older!! 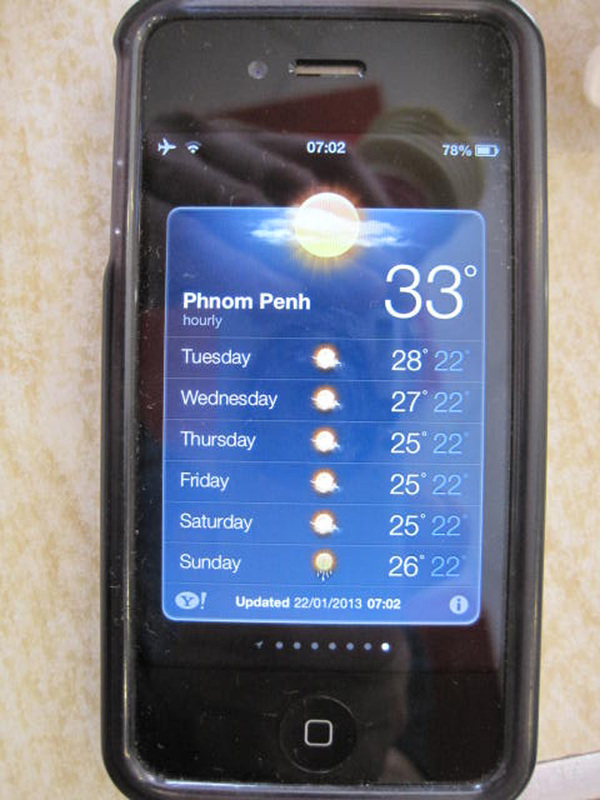 So on the morning of 28th of January we are back in Siem Reap! The VIP minibus was very smart and comfortable, but they are driven very quickly with lots of scary overtaking. I’ m sure that the drivers are good, but they are young and enthusiastic! We are thinking that we may stick to the normal buses from now on. 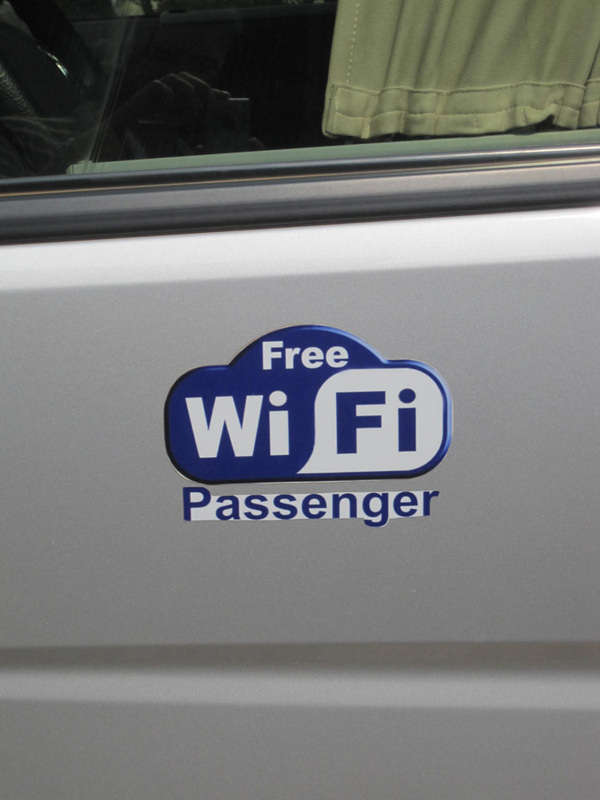 Even the minibuses have free wifi! 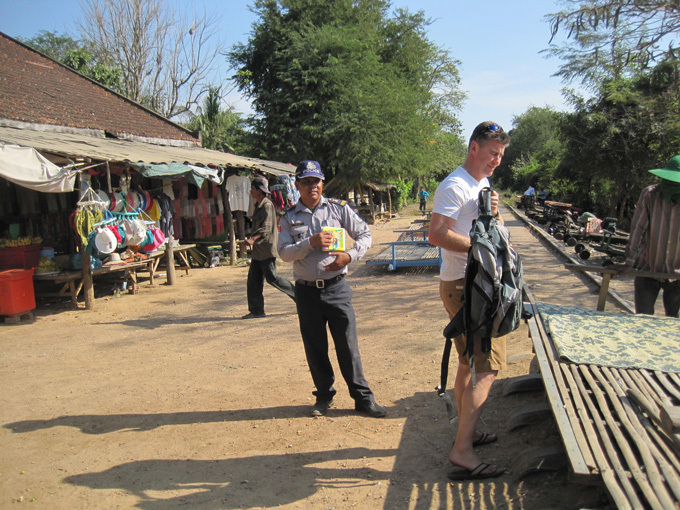 We arrived right on time and were picked up from where the bus stopped by the guest house tuk tuk. The guest house was a bit more expensive as it has a nice pool. 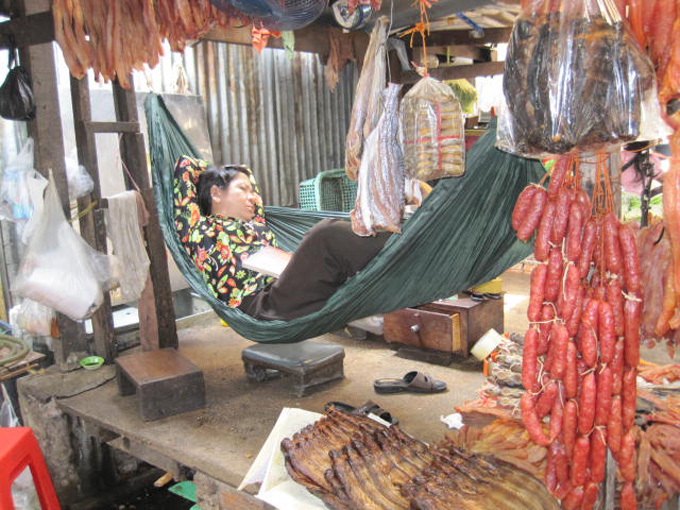 It costs around $20 per night. It is not right on the beach, but around 200 m away, so only a two minute walk to all the beach side restaurants and bars. As you walk to the left (east) as you are on Ochheuteal Beach. If you turn right you hit Serendipity Beach. 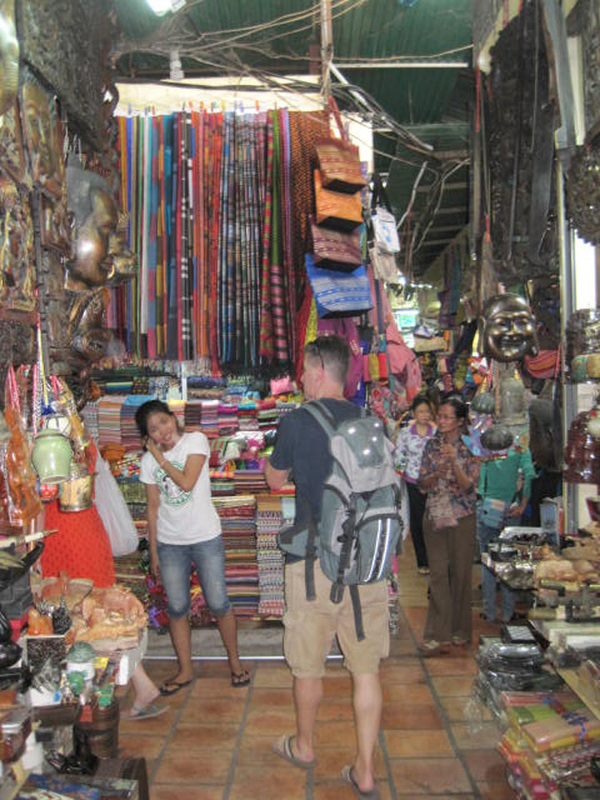 This is busier and more developed and very popular with backpackers. 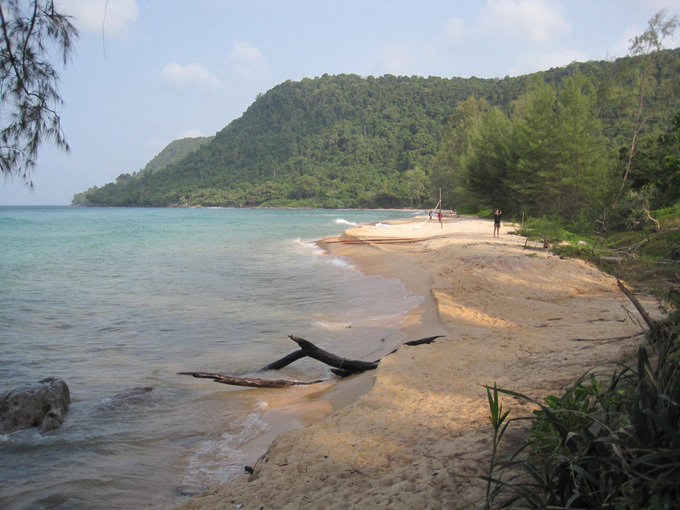 Tomorrow we are planning to walk along to Otres Beach, which is the next one along and less developed. Very little done today other than a walk along to Otres Beach. As promised it gets less developed as you go in that direction. There are still groups of restaurants and bars there. These are slightly more expensive as I suppose less competition. Still cheap by western standards though. 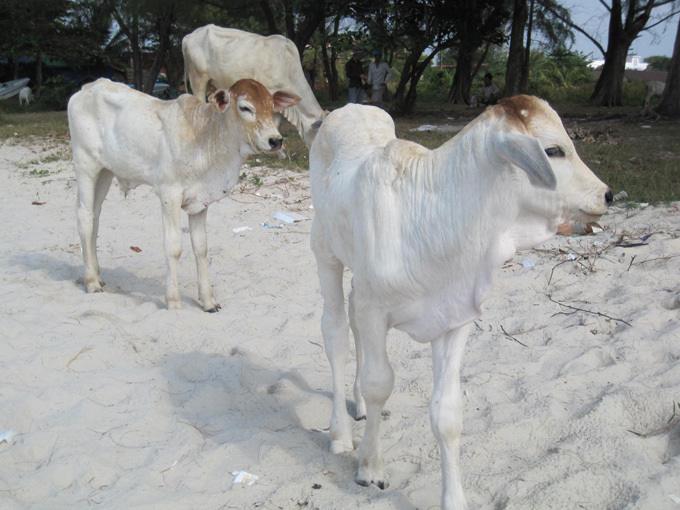 The land at the back of the beach is used for grazing cattle. They are really delicate looking Asian breed but not sure of the name. 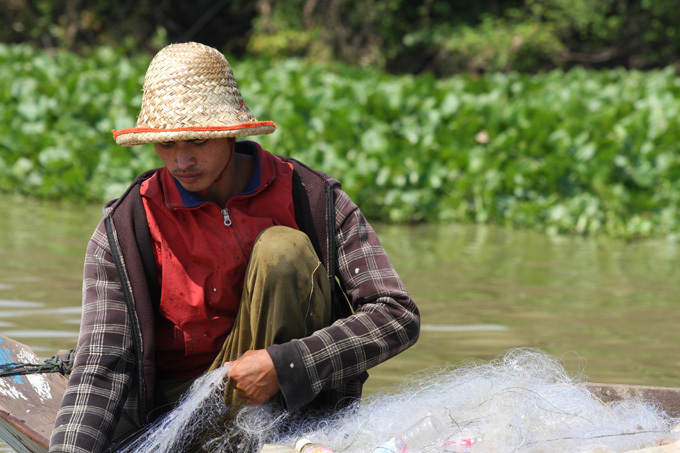 The problem of plastic waste is still very apparent. Even a single bottle of water is passed to you in a plastic bag unless you refuse it. Refuge collection is pretty hit and miss. 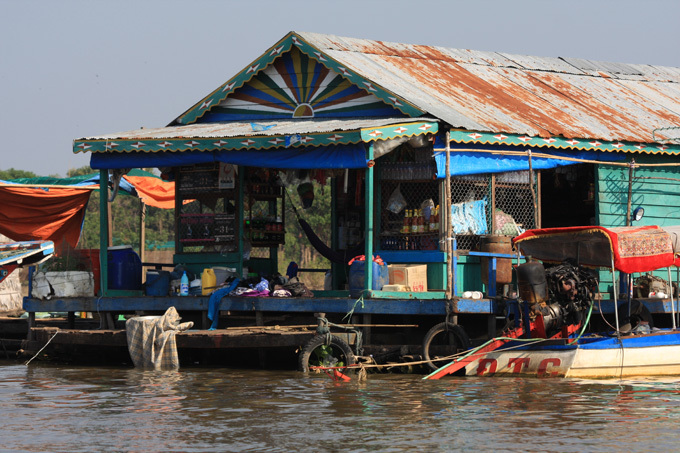 Cambodia is a beautiful place, and it is such a shame when you see piles of waste plastic in what otherwise would be a perfect spot to sit and look at the view. 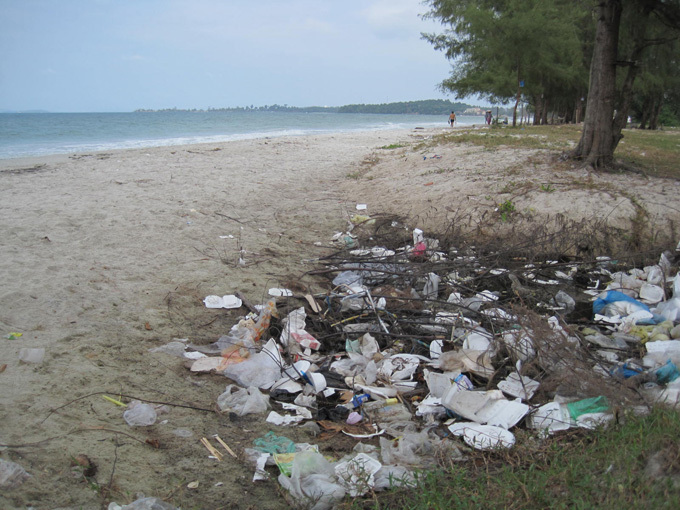 I am sure it will improve with time, but don’t expect a western approach to litter. 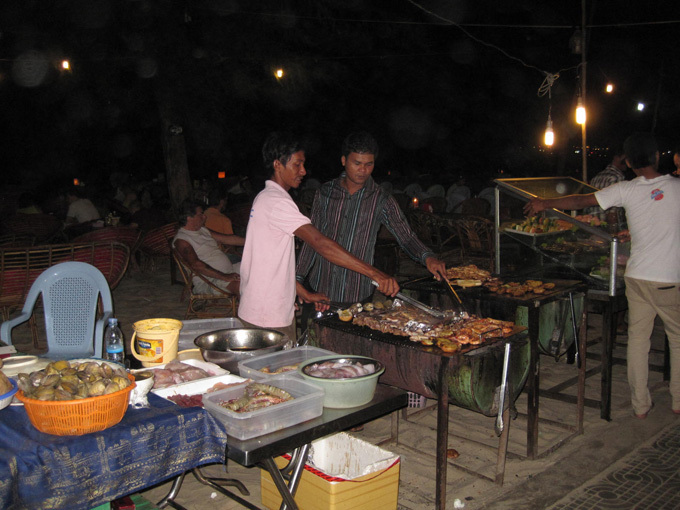 After a couple of hours sorting washing and booking the next bits of the trip, the beach BBQ’s were in full swing. 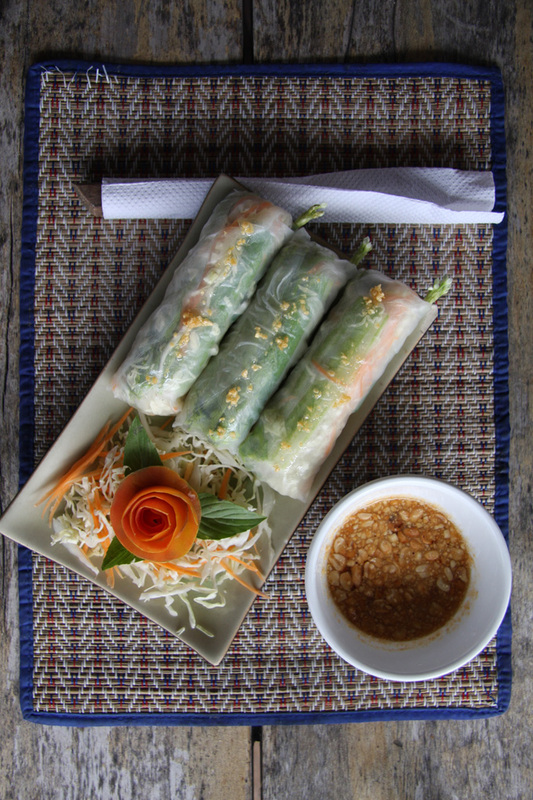 Every restaurant in the strip competes hard for your custom, all doing the same thing at the same price …. tricky to choose! 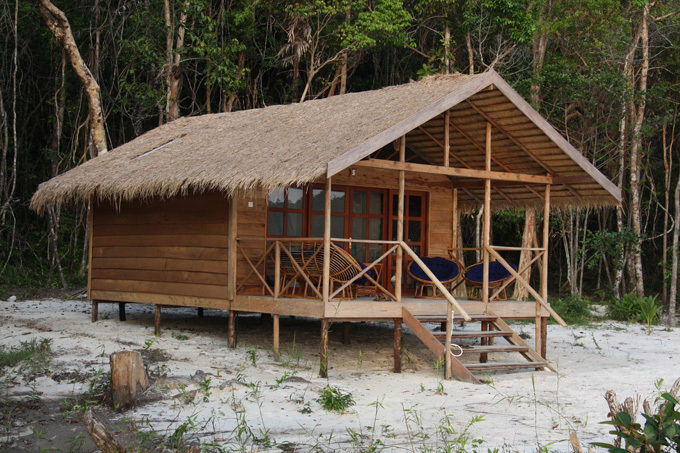 Tomorrow we are booked on a boat to take us to the Islands to stay in a beach bungalow. There is probably no internet, so will be a couple of days before we update . Cost $5 including an excellent and moving audio presentation/tour. The first thing you see when you arrive at the site is the memorial. 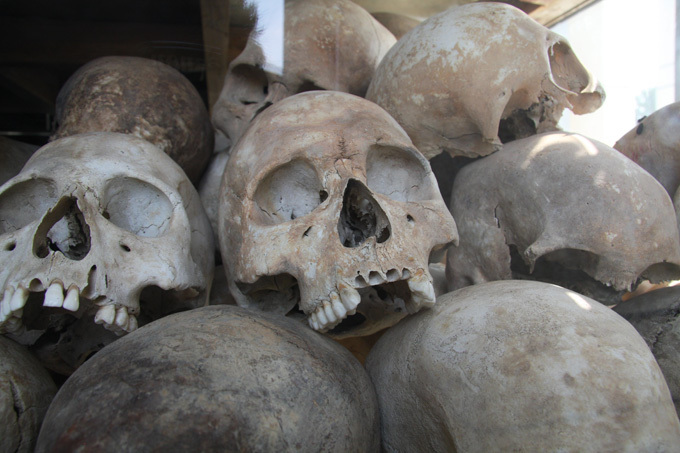 It contains the remains of some of the victims of the genocide. 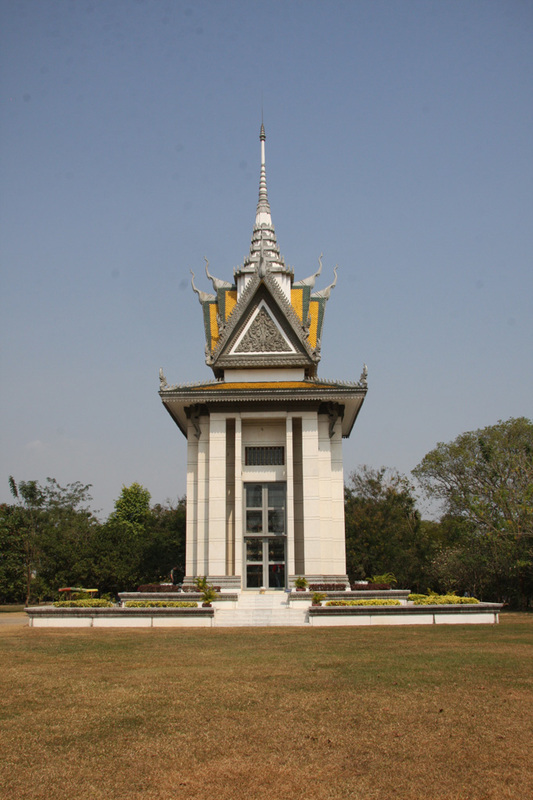 Around 8000 bodies, mostly bound and blindfolded were exhumed in 1980 and housed in the tall glass structure inside the memorial. 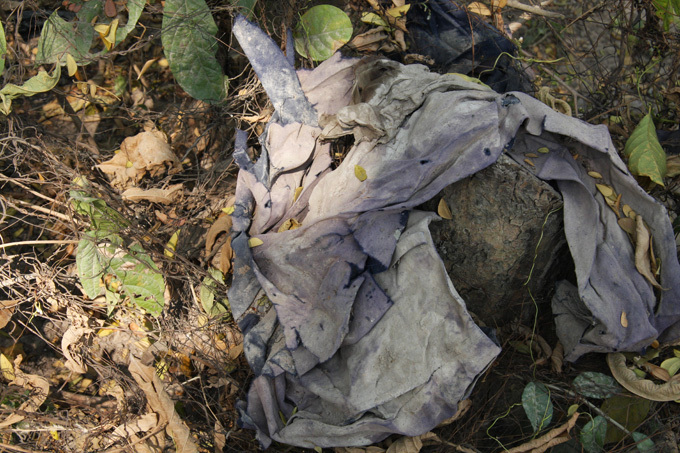 The remaining 43 mass graves have been left untouched. You can still see the hollows in the ground where each grave is sited. As you walk around the site you notice that there are human bones everywhere in the soil. Each time it rains more clothes and bones are exposed. 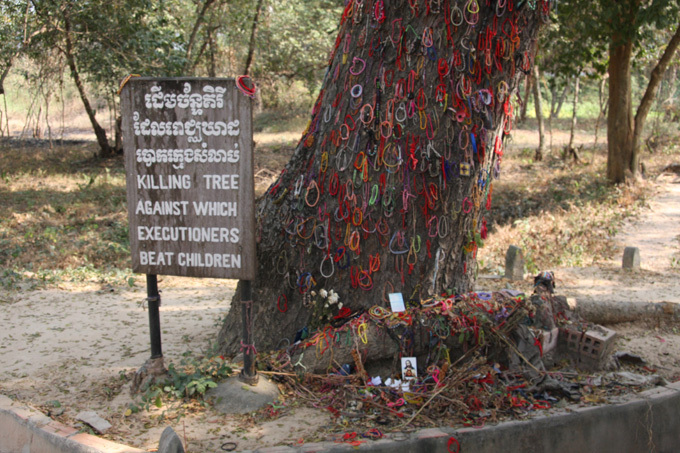 The most moving part of the visit and the most shocking is what they call the killing tree. It is where babies and young children were murdered by holding their feet and swinging them at the tree head first, often watched by their mother. 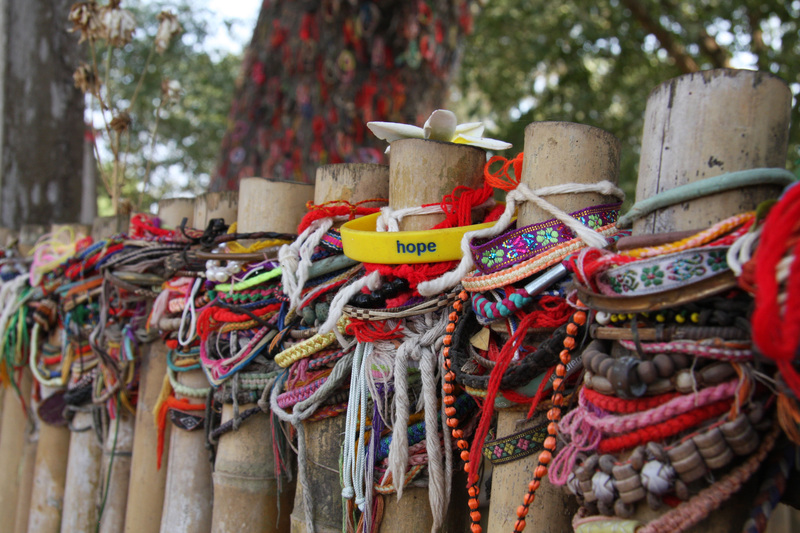 The area is covered with bracelets left by the visitors to the site. On the way out of the site there is a museum which has a good display of background information. 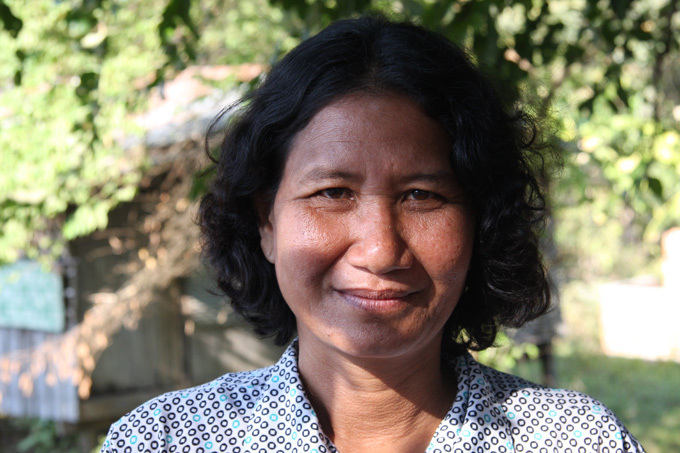 Shockingly Pol Pot hid himself away close to the Thai border, remarried and enjoyed another 20 years with his family and grandchildren. Something his victims could not do. 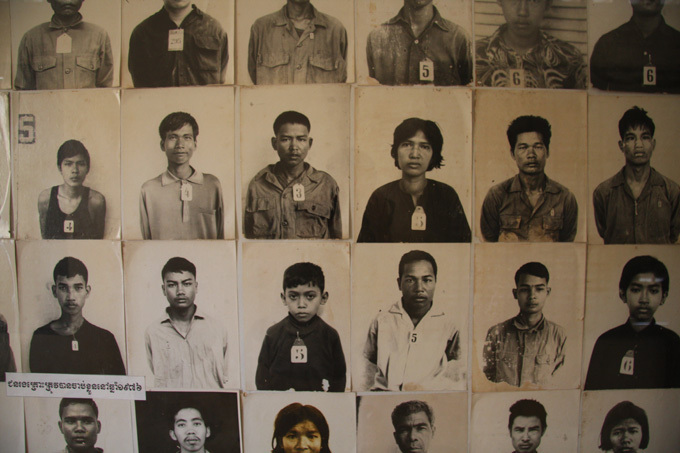 Even more amazing is the fact that the west continued to recognise the Khmer Rouge as the rightful leaders even though a new government had been formed with the help of the Vietnamese. They even had a representative on the UN. The others involved in the genocide have yet to be convicted. They are in their 80’s now and their lawyers seem able to delay and delay. Justice may never be served. The road back to Phnom Penh city was hot and dusty. Lots of construction is going on in the city. 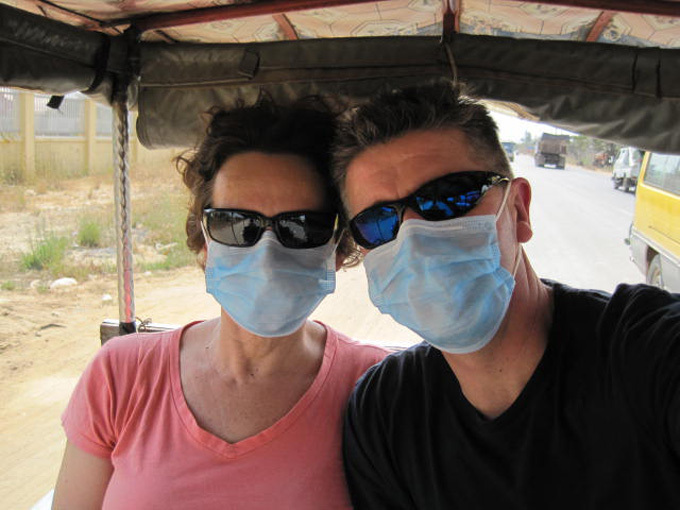 So dusty in fact that we had to get masks to avoid being choked by both dust and fumes! We then headed to the Russian Market, that is nothing to do with Russians other than the fact that during the 1980’s most of the foreign customers were Russians as nothing was available to them back home. 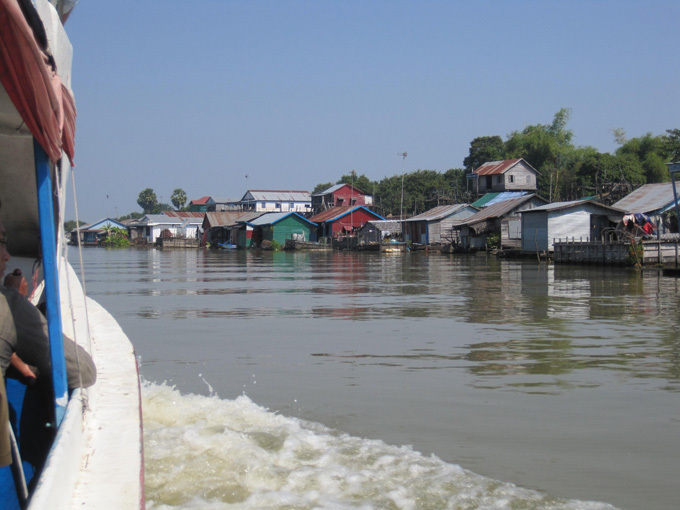 After the market and lunch we headed off to the riverside area (north). 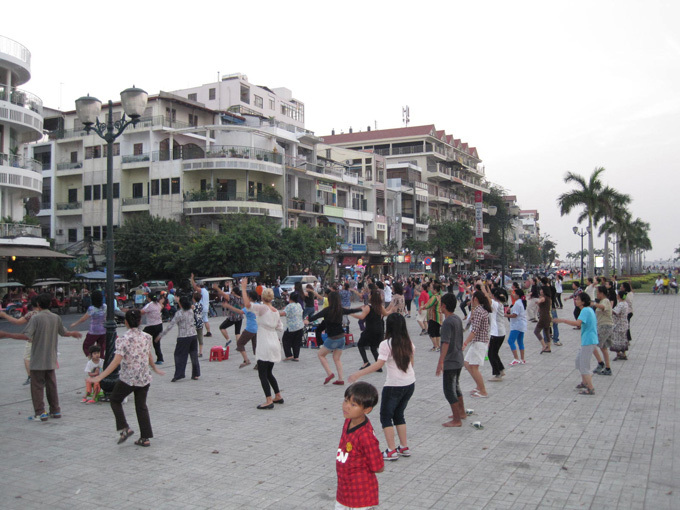 In the evenings the locals and tourists tend to gather and play football, badminton and a sort of kick up game with something that looks like a long narrow shuttlecock made of cork and feather. 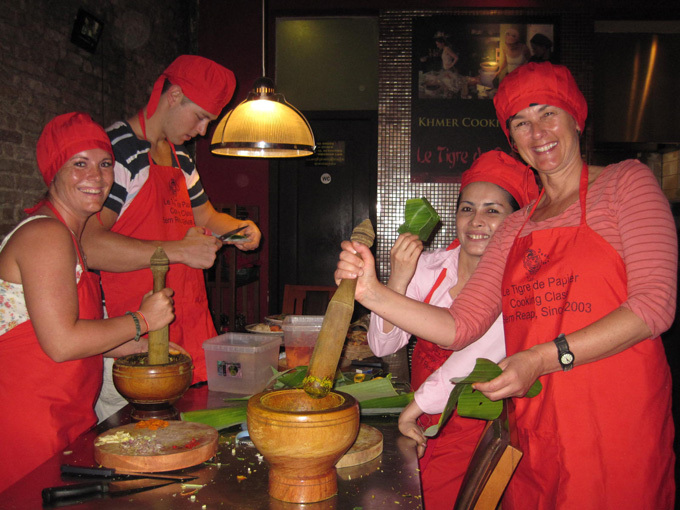 Families are sitting around eating tasty snacks ….. ? 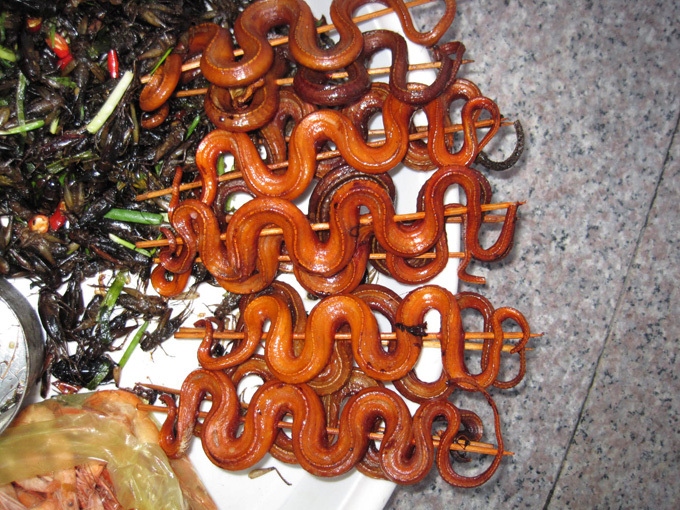 You can choose from snakes on a stick …. 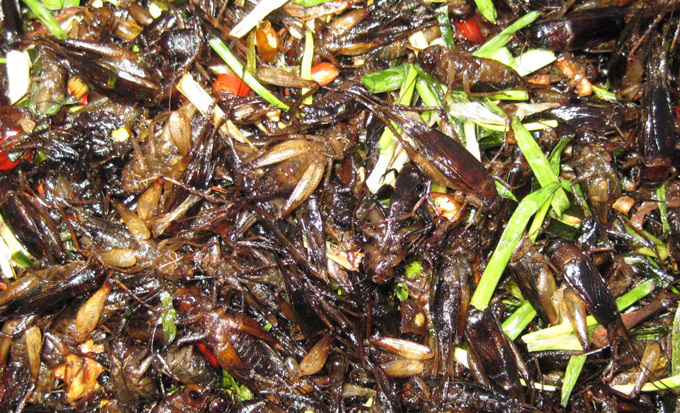 through to a sort of insect salad mix. It looks ok from a distance, but as you get closer, slightly less appealing! If you are not hungry straight away and need to work up an appetite, there is a nightly street aerobic class (here and many other parks around the city). After that, you may want double helpings!! The girls selling the snacks thought it was so funny that we would not try a snake. We eat every day, they said! Looking down at the murky river where they catch them, I was still happy to refuse. Maybe if they were caught in a countryside area I might give it a go. 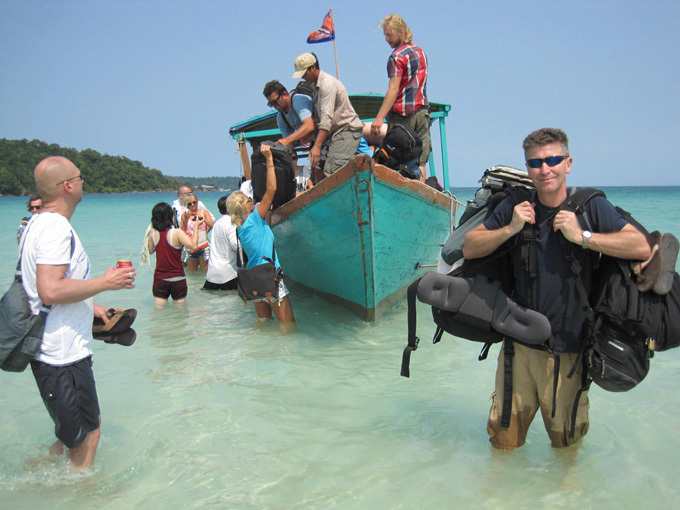 Tomorrow we take the VIP bus to Sihanoukville. This one costs $9 for the 3.5 hr journey. Nearly double the price of bus, but almost half the time. 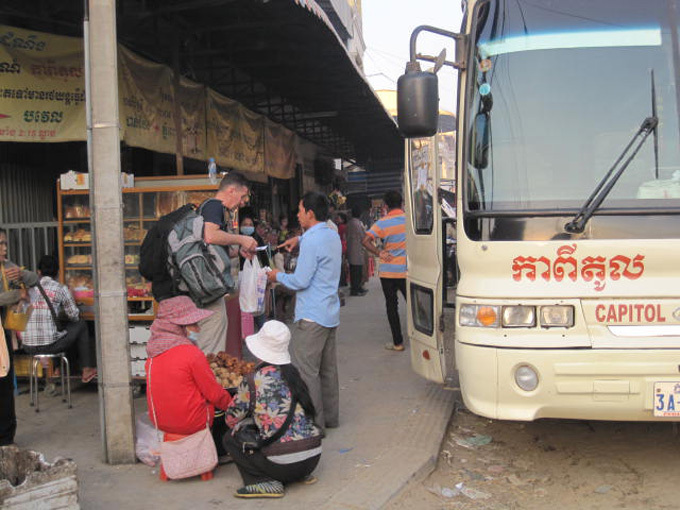 The bus to Phnom Penh from Battambang bus station was a pleasant surprise. At $5 for a five hour trip, your expectations are not that high, but the bus was smooth, quiet and the aircon worked. The driver was also reasonably careful and did not go for the mad overtaking that you sometimes see in Asia. We were actually the only westerners on the bus and the only ones who used the seatbelts! It seems that the hotels and guest houses tend to push another company that does the trip for $0.50 less. We booked the Capitol bus directly with the bus station (desk/table nearest the door). Really good. The bus did stop quite a bit for drinks and food and to pick up the occasional extra person (dropping them off somewhere a bit further on), but it arrived on time. 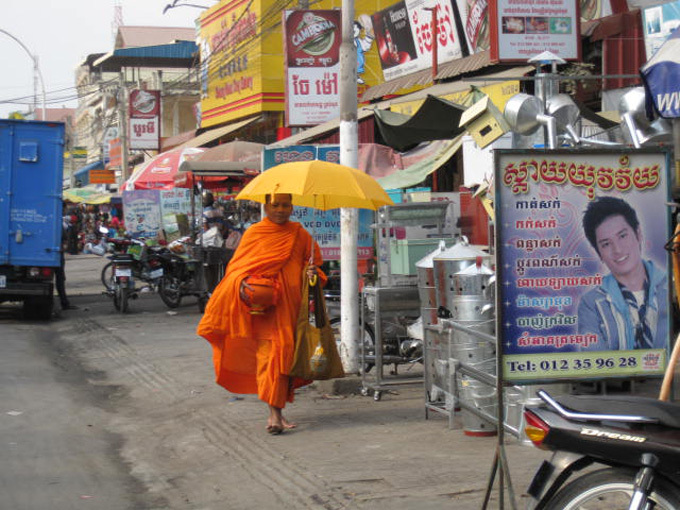 As usual it was a bit of a scramble on arrival in Phnom Penh as the tuk tuk drivers push for your business. They all started at $5 to go to the hotel which was probably only ten minutes drive away. We finally settled at $2 which seemed expensive, but turned out to be the going rate for that sort of distance. We had them walk away when we said that we would only pay $2 for one trip. The city was busy and all the hotels were full and the pickings were rich. We saw lots of people agreeing $5 and so the drivers are getting a bit spoiled. We want to be fair, but ‘don’t want our heads shaved’ as the locals say when you are ripped off. 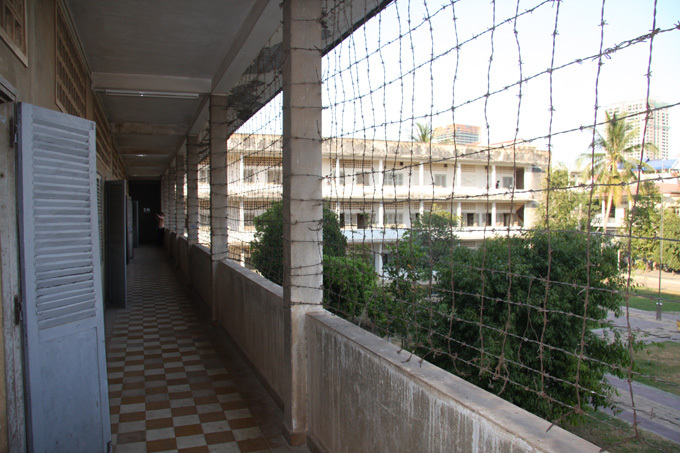 Our plan was to visit the Tuoi Sleng ( S-21) which was a school that had been converted into a prison used to hold the Khmer Rouge prisoners for torture, before being transferred to Choeung Ek (one of the two or three hundred sites used to kill and dispose of the bodies of Pol Pot’s supposed enemies). Pol Pot was educated in France, obviously from privileged background and his aim was to create his own twisted version of a perfect communist state. He banned currency, closed all borders to neighbouring countries with mine fields and expelled all urbanites to the countryside where they were forced to live off the land. Not only producing enough to live on, but he demanded an impossible threefold increase in rice production. This was sold/traded to the Chinese for weapons. In order to achieve total control he set about exterminating anyone who he felt was a threat. That included anyone previously in power, educated people, people with soft hands and even people who wore glasses. These people were tortured until they signed confessions of crimes against the state, often implicating family and friends, who were in turn arrested. Although only really in control for around 3.5 years (1975 to 1978) up to 3 million of his own people were killed. This represented about 25% of the total population. He is quoted as saying that it is better to kill an innocent person than to let an enemy live …. 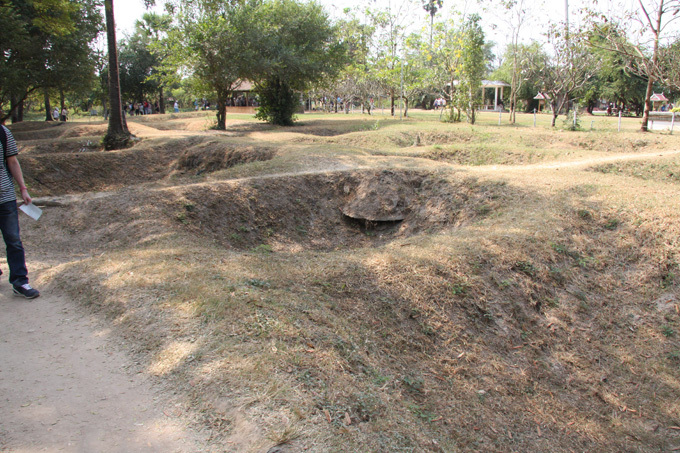 S-21 is a harrowing place to visit, but important as an introduction to the exhibits at the killing Fields. We found a tuk tuk driver outside the hotel to take us to S-21. 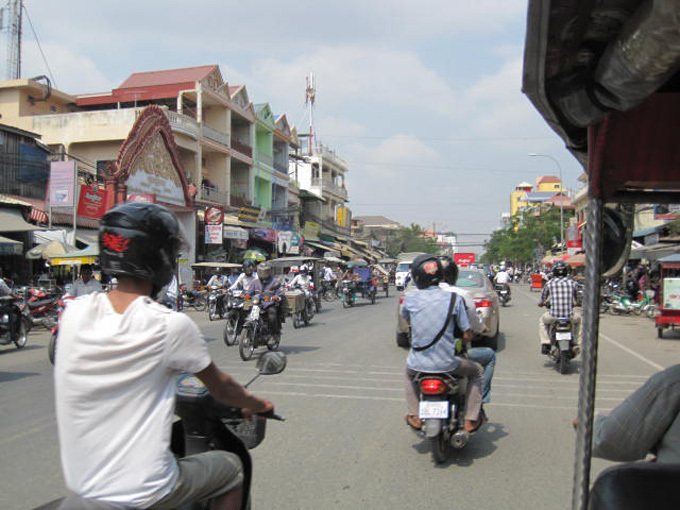 Phnom Penh is a busy place with motorbikes whizzing in every direction. 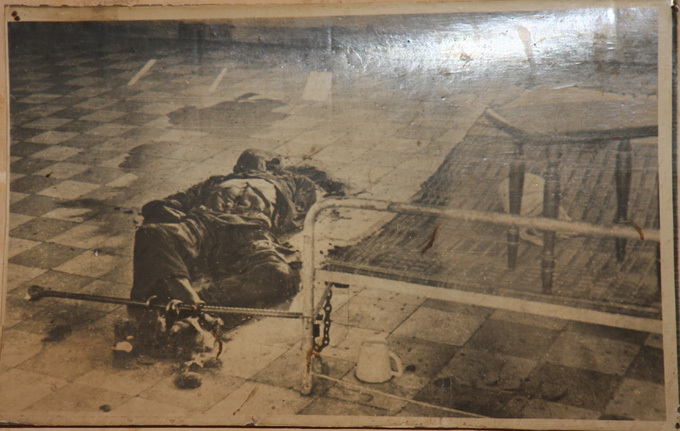 The school building was a modern design, which brought home how recently this had happened to the poor Cambodians, barely recovered from the bombing that they suffered during the Vietnam war. The first room we entered had a metal frame bed with leg irons to hold prisoners. 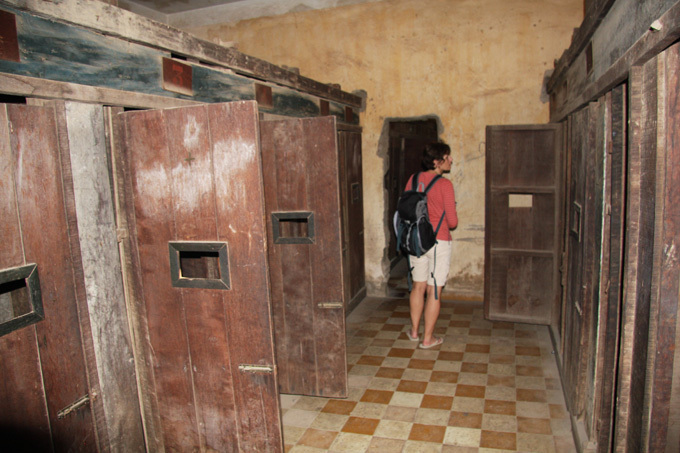 These bigger rooms were used to hold and torture political prisoners from the previous regime. 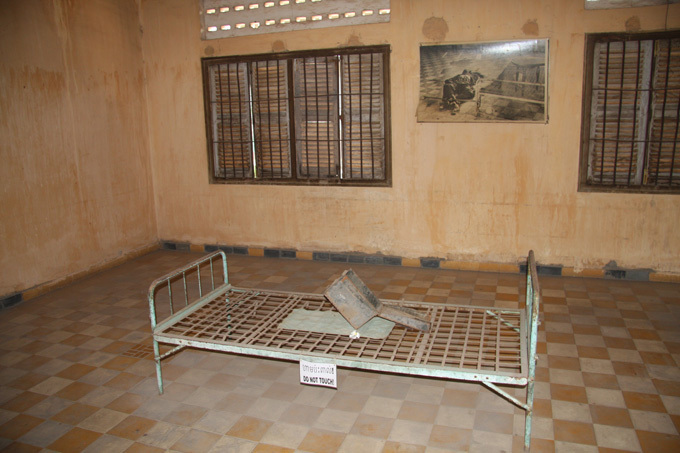 In this room there was still a body chained up when the liberation forces arrived. The record keeping was meticulous, all prisoners were photographed on arrival and then photographed after torture. Signed confessions produced and filed. There were women, children and even babies. The photographs of the women included some with babies. The babies were killed in the most brutal manner. Around 20,000 people came through this camp. Of them only 7 survived. 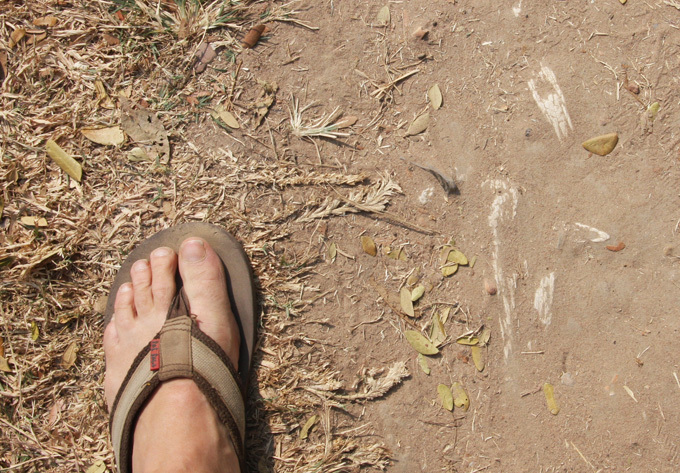 After walking around S-21, two questions struck us. Firstly, how can humans treat each other so cruelly? 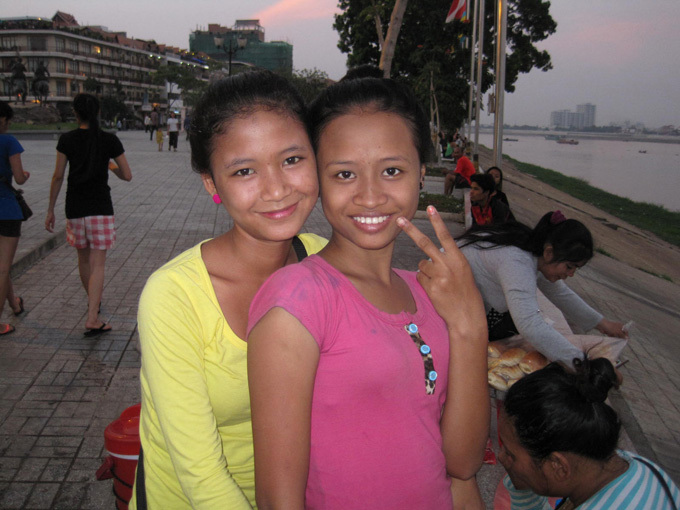 Secondly, how did the Cambodian people manage to pick themselves up after such a terrible series of events, and keep smiling? The tuk tuk journey back was another opportunity to observe daily life. That was not so easy while driving Troopy! There are some advantages in not driving! This is something you don’t see in Exeter. We had a lazy morning with no alarm and a slow breakfast. We then spent a couple of hours catching up with e mails and uploading some pictures for the website. If you slip behind it becomes a chore to catch up! 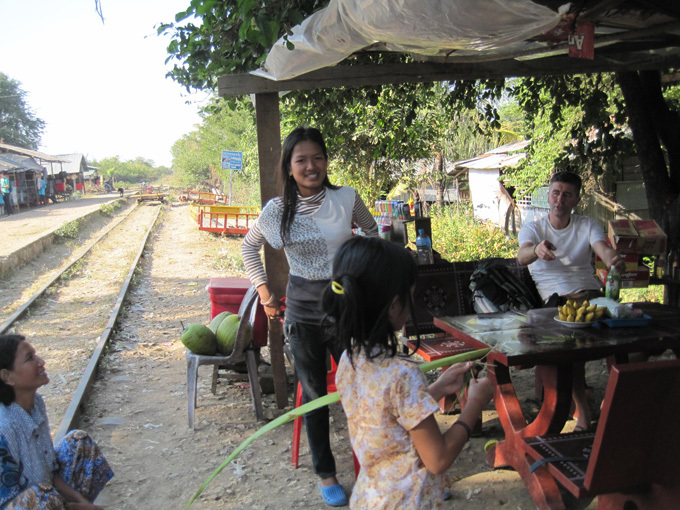 We had heard about the ‘ bamboo train’ which was built by the french to move locals, produce, animals, motorbikes or just about anything else you can imagine. 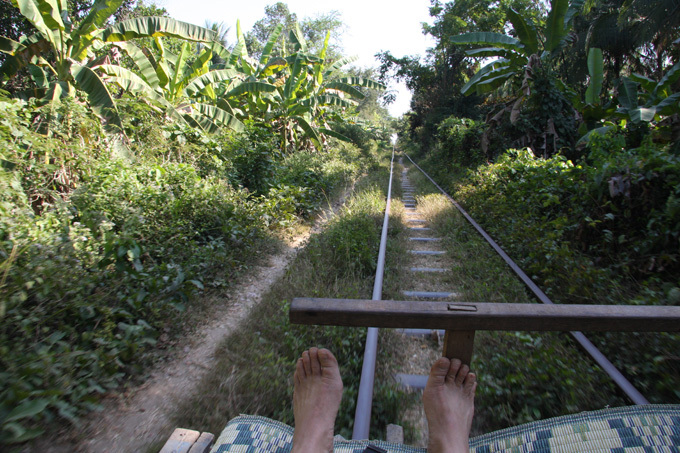 They could just hop on the flat bamboo platform and the small engine and drive belt would propel the cart along the tracks at a surprising speed. It is now solely for tourists as only runs for about 20 mins out and 20 mins back. 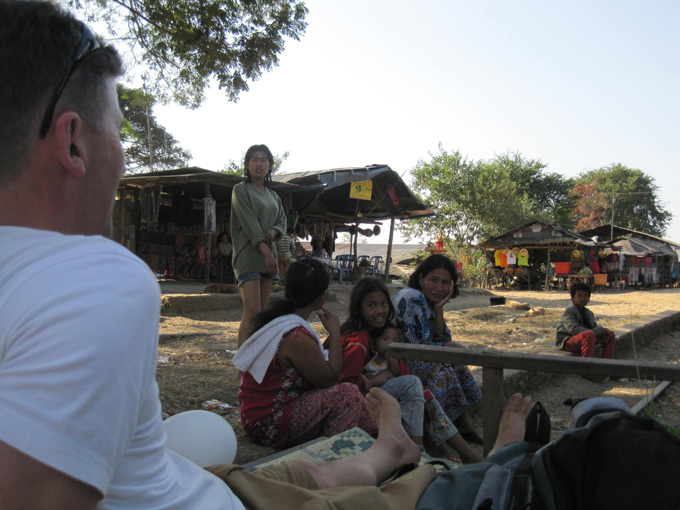 At the stopping point at the end you can get drinks or snacks and support the locals by buying a scarf etc. If you pick the small stand on the right as you arrive, they are not too pushy and are really sweet! 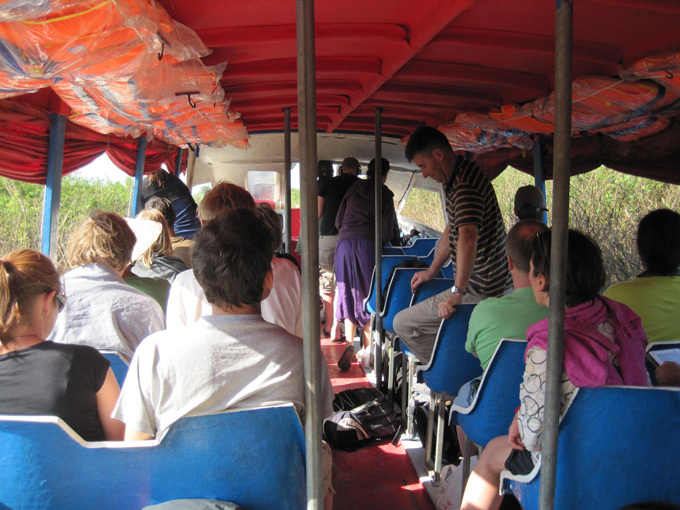 It is a fifteen minute tuk tuk ride out of town to the starting point. As you shoot along the rails (much faster than you thought you would) it is pretty bumpy and a little noisy, but great fun! There is nothing to hold on to and you keep thinking about stories you have heard about wheels falling off …. but it is fine! When a train comes the other way, you have to stop and jump off and dismantle the train and reassemble after the other train is pushed past. It must have been a real hassle when loaded up fully with produce. The wheels / axles are only held in place by gravity …. that’s why they come off sometimes! The family running the stall were very nice and so it was good to buy a drink and a scarf from them. One of the girls had a particularly sweet face. 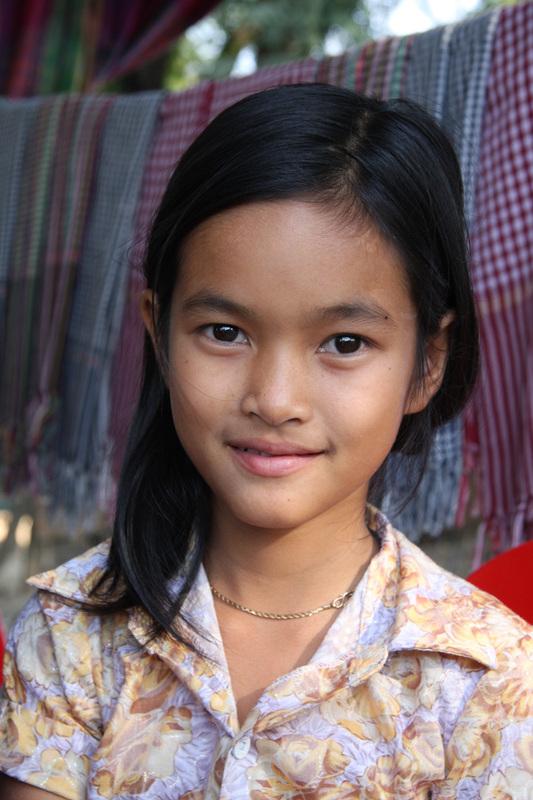 You can see the traditional Khmer scarves behind her. After about 15 minutes we boarded the ‘train’ and headed back to the start. 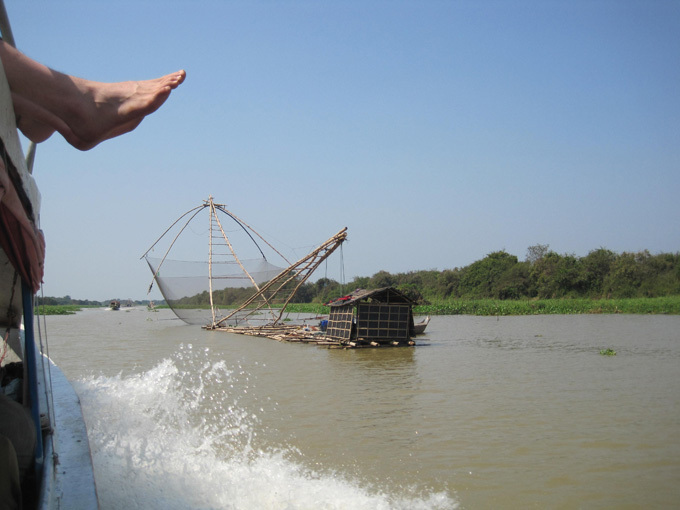 It is a really touristy thing to do, but was great fun and the people nice. It is said that the Japanese are funding a ‘proper’ train on the same route. 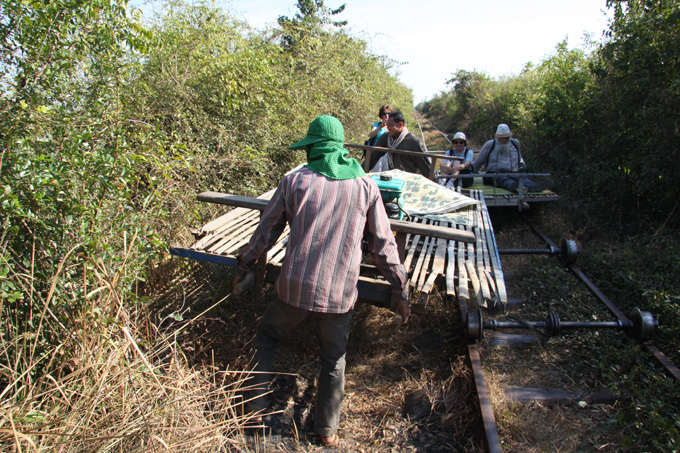 If this happens, the bamboo train is likely to go. So do it now or never! 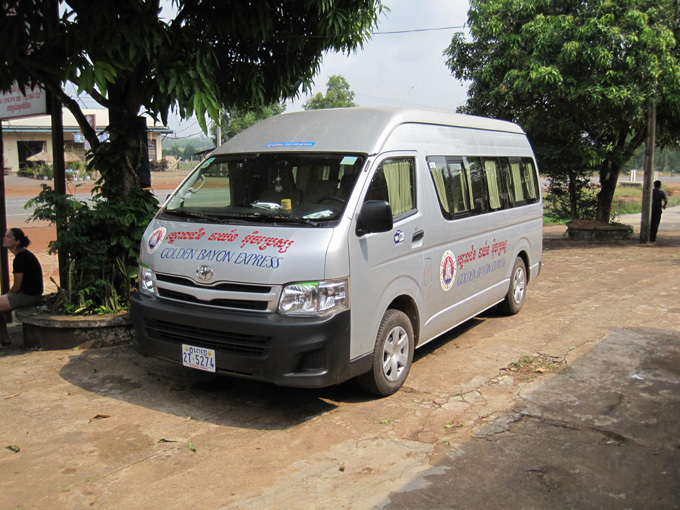 Tomorrow we are booked on a bus ride to Phnom Penh. It is around 5 or 6 hours in air conditioned luxury and all for $5 each! Another early start as the pickup for the boat trip to Battambang is supposed to be around 6.30 am so that the boat can leave at 7.00am. Setting the alarm for 5.30 am seems wrong when you are on holiday! If fact, we didn’t need to bother as the bus finally arrived at 8.00pm. The trip took about 30 minutes and we made another pickup with about 15 people even though the bus was already full … They all seemed to fit in somehow! The boat finally left the jetty at 8.30 am with exactly the right number of people on. Empty by cambodian standards! 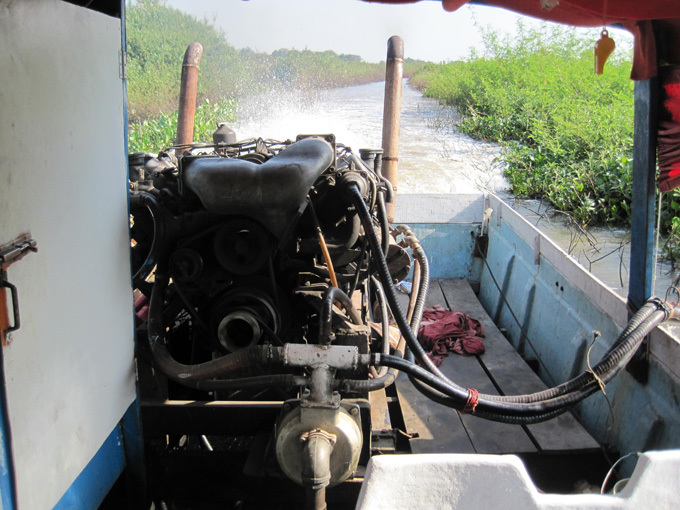 The engine was massive with no silencers, so the seats at the back next to the engine did not stay used for long! 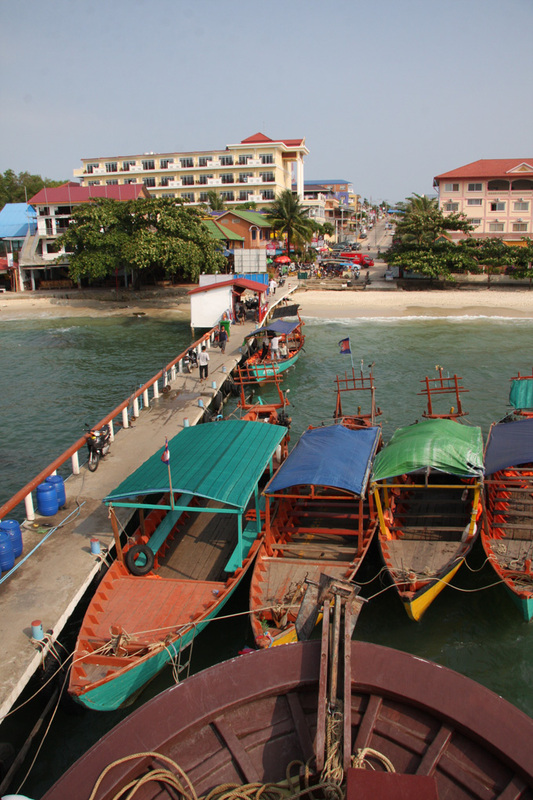 All along the journey are beautiful floating villages and you can see everyone going about their normal life, shopping, catching fish, washing etc. It is really nice to see. 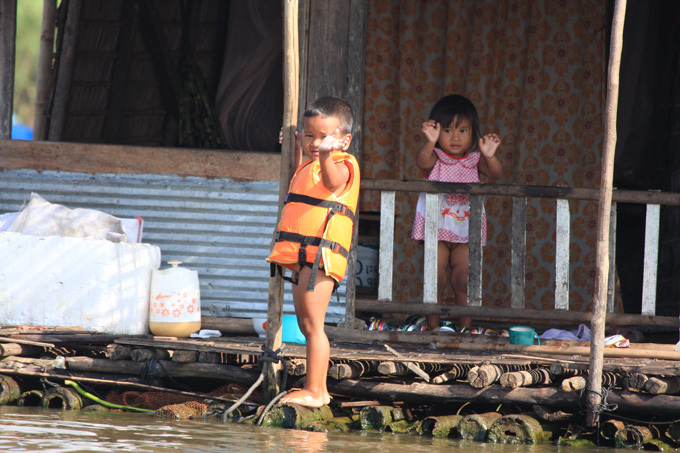 The children (and adults) are so friendly and the children wave like mad as soon as they see the boat. 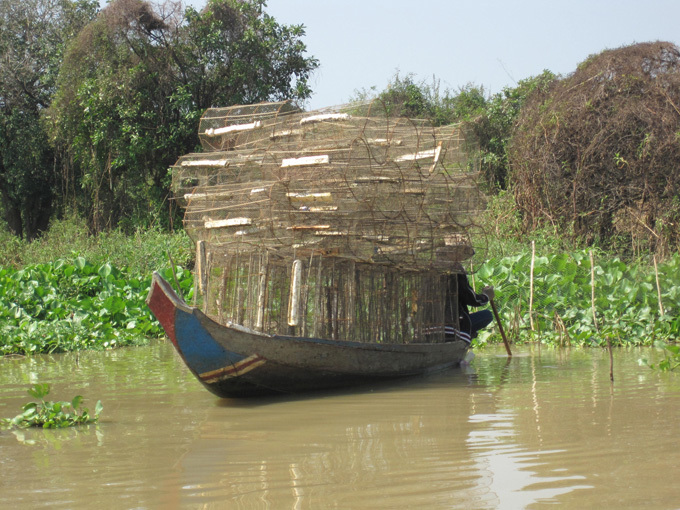 Some fish from bamboo rafts with big booms to lift the net. 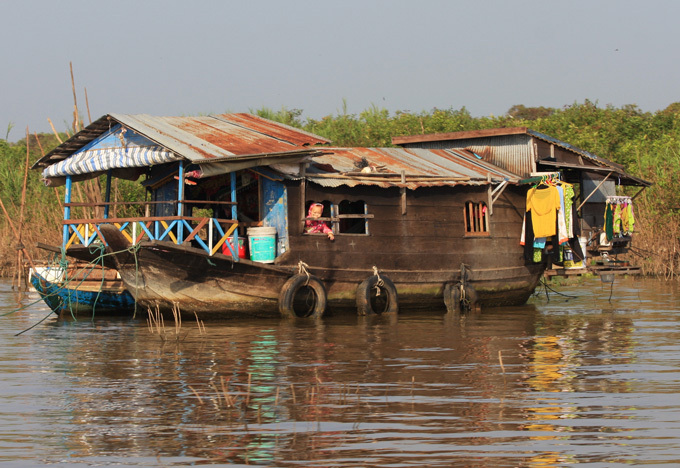 Every turn of the river you see another great sight, but probably the nicest thing is seeing the local people. 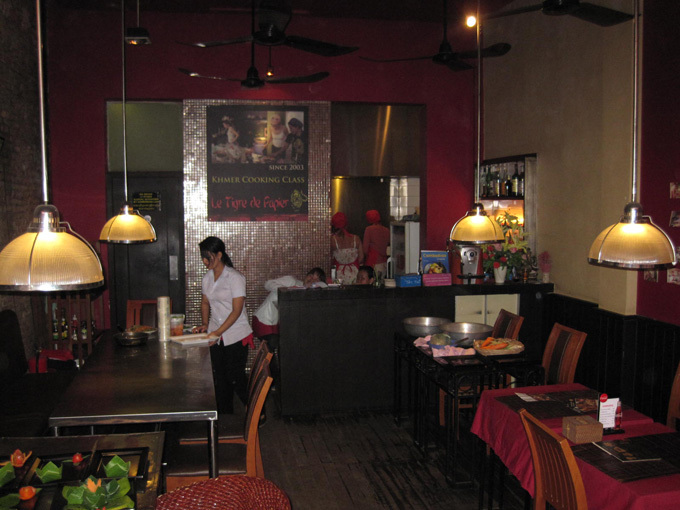 After eight hours we arrived in Siem Reap and walked the 500m to the Star Hotel. Really nice and rooms are between $6 and $20. We splashed out and for $15 had a big room with aircon, hot shower, fridge and comfy beds.